CitriSurf® 77 is a high quality blend of chemicals formulated for the cleaning and passivation of stainless steel products. It is provided in trigger sprayer bottles for applications where it is desired to spray the product on a local area. CitriSurf 77 is specifically designed to provide a portable, low cost and efficient removal of contaminants and all free iron from the surface of stainless steel, providing the highest chrome oxide levels possible. 22 oz. spray bottle. Citrisurf 77 is also available in 1-gallon and 5-gallon containers. 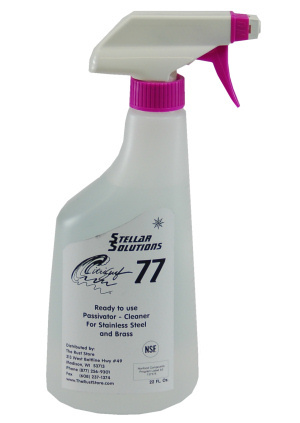 Application Procedure: CitriSurf 77 is an excellent cleaner by itself for many cleaning and passivation processes. However, to assure best results, it may be a good idea to clean the parts or areas to be passivated, with an appropriate cleaning solution prior to treatment with CitriSurf 77 solution, especially when heavy grease and oils are present. If there is rust on the surface that must be removed, you may want to use CitriSurf 77 Plus which has additional additives to aid in rust removal. 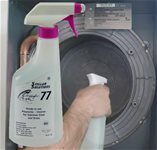 The parts or areas to be cleaned and passivated should be sprayed, immersed or wiped with CitriSurf 77 to completely wet the surfaces, especially in crevices or in areas where rust or corrosion may have occurred. The surface must be soaked or left moist with the CitriSurf 77 solution for a period of 15-30 minutes at room temperature. After soaking, rinse the surface with clean water. The surface can then be wiped dry with a clean cloth or appropriate absorbent medium. Allow the surface to air dry prior to use. CitriSurf 77 will not harm stainless steel appliances or surfaces, and will enhance the brightness when used as directed.